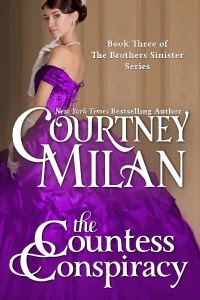 Tomorrow, December 17, is a big day for many historical romance readers because Courtney Milan's The Countess Conspiracy, her latest instalment in The Brothers Sinister series, will be released. I've cleared my reading schedule and have no review or blog posts scheduled (except for the two author features and Throwback Thursday) because I know I will be reading this book the minute it downloads into my e-reader. But, today, December 16, is a big day for Love Saves the World because I have the pleasure of featuring Courtney Milan. I've read Courtney Milan since her debut novel and her stories always strike me as a little bit different, a little bit unusual from the many stories that I read. 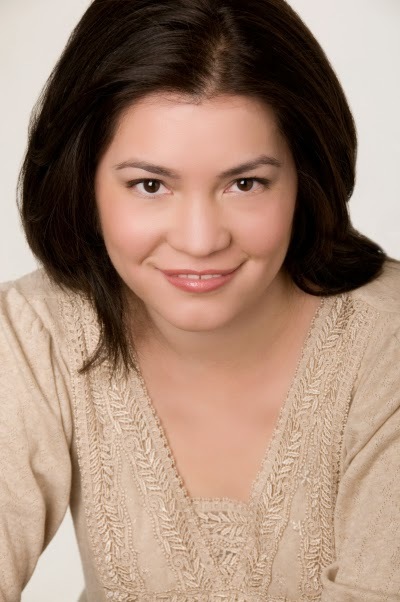 From her fortune-telling scammer heroine in Proof by Seduction to her Turner Brothers and their amazingly mind-blowing Biblical names and to her current series -- she has created characters and situation that are impressive and impactful to the world of historical romance. Anyone who has read my blog will know how much I love and admire Courtney Milan as an author -- and today, is truly a major milestone for me and my little blog. LStW: Can you tell us the story behind The Countess Conspiracy, the latest book in your The Brothers Sinister series? Courtney Milan: My idea for The Countess Conspiracy came from many, many places, but two of the huge influences are this. First, Jane Austen herself. Even though she was hugely successful, she published her amazing books under the name of "A Lady." And if you read about her life, it's obvious that she felt in some ways that she couldn't let people know about her writing. She used to write her books on scraps that could be hidden if someone came into the room. That, to me, was a very sad story -- that someone who wrote books that have spoken to so many throughout the years felt that her most triumphant achievement needed to be hidden away. Second, the story of Rosalind Franklin. Rosalind Franklin was an X-Ray Crystallographer in a time when not many women were scientists. Her work on DNA was an absolutely crucial part of the discovery of the structure of DNA by Watson and Crick -- who were shown her work without her permission or knowledge. Her name was not on the seminal paper announcing the structure, and while Watson and Crick were awarded the Nobel prize for the discovery, her name is remembered as a footnote in history. I will say one other thing: I have some books that I feel come from deeper inside me than others. This is, for me, that book. I don't know if that will come through in the execution, but this book means a lot to me. I can't say anything more about this book without giving out spoilers. Courtney: Eowyn from the Lord of the Rings. She is a badass with a sword, and she slew the Witch King of Angmar. It doesn't get any better from that. Courtney: First and foremost, I'm thankful for my happiness. These last few months have been very good for a number of reasons. That's not always the case, and I think it's important for me to appreciate that. I'm thankful for my friends. They're there for me no matter what, and they're the reason I've made it through to these times. And I'm thankful for my readers. 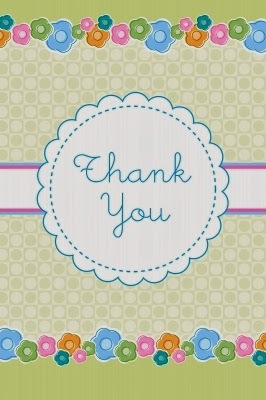 Without you, I wouldn't have a career -- but just as importantly, without you, I wouldn't have anyone to write for. It means so much to have people recommend my books to others. Courtney: Honestly? I'm really bad at Christmas gifts. But for the person who has everything, I like making donations to heifer.org on their behalf. Giving a flock of chickens for Christmas is pretty cool. LStW: (New Year) What's next for Courtney Milan in 2014? Courtney: I'm going to finish off the New Year with the final full-length book in the Brothers Sinister series (the Mistress Rebellion) -- a story of Frederica Marshall, a suffragette, and the Earl who is absolutely opposed to women's rights but can't help falling in love with her anyway. There will also be a novella that I think of as kind of a coda to the series (called Talk Sweetly to Me), about a woman who is a computer -- which in the Victorian era meant that she did complicated calculations for other people. After that, I'm going to be starting a new series that I'm tentatively calling the Worth Saga. It (loosely) follows a family that has been torn apart by treason. I don't have a better description than that yet. Read my review of The Governess Affair here. Read my review of The Duchess War here. Read my review of A Kiss for Midwinter here. Miss Jane Fairfield has made a career of social disaster. She wears outrageous gowns and says even more outrageous things. The only reason she's invited anywhere is because of her immense dowry -- which is all part of her plan to avoid marriage and keep the fortune-hunters at bay. Mr. Oliver Marshall is the illegitimate son of a duke. His acceptance in society is tenuous as it is. If he wants any kind of career at all, he must do everything right. He doesn't need to come to the rescue of the wrong woman. He certainly doesn't need to fall in love with her. But there's something about the lovely, courageous Jane that he can't resist ... even though it could mean the ruin of them both. Read my review of The Heiress Effect here. Sebastian Malheur is the most dangerous sort of rake: an educated one. When he’s not scandalizing ladies in the bedchamber, he’s outraging proper society with his scientific theories. He’s desired, reviled, acclaimed, and despised -- and he laughs through it all. So when Sebastian threatens to dissolve their years-long conspiracy, she’ll do anything to save their partnership ... even if it means opening her vulnerable heart to the rake who could destroy it for good. The Countess Conspiracy will be released tomorrow, December 17. For more information about this book, click here. Courtney Milan lives in the Pacific Northwest with her husband, a marginally-trained dog, and an attack cat. Before she started writing books, Courtney experimented with numerous occupations. She has trained dogs, written legal briefs, sold newspaper subscriptions, and written computer programs. Having given up on actually being able to do any actual things, she's taken to heart the axiom that "those who can't, teach." When she isn't reading, writing, or sleeping, she can be found in the vicinity of a classroom. Courtney loves hearing from readers. You can visit her on the web and find out more about her and her newest releases at http://www.courtneymilan.com. For this week, as support for the authors, I'm hosting a giveaway for one copy of The Countess Conspiracy, the newest book in Courtney's The Brothers Sinister series, which releases tomorrow (December 17). 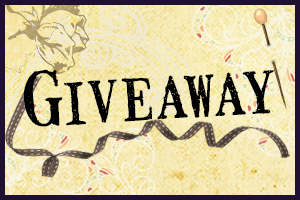 *This giveaway will run until December 23. Drop by on Wednesday for the next author feature! Looking forward to this one. I'm hearing lots of positive buzz about it. I enjoyed the interview:) I'm looking forward to reading this book and have added to my TBR stack. I'm really looking forward this next installment if only because I love Sebastian from all the other books. Wonderful Interview! Courtney is one of my favorite favorite authors. I love all of her books. I cannot wait to read The Countess Conspiracy asI have been counting down the days until it's available (eeekkk ONE more day to go). I was sooo waiting for this book!!! Love S&V! There will be sparks and fire, that's for sure! I'm always waiting eagerly for Courtney's books. I've been looking forward to this one, for Violet's story as much as Sebastian's. Also looking forward to Free's story. i was feeling a little sad to hear the last of the Brothers Sinister novels are coming to an end, but then super excited to hear what Courtney has coming for us in the future!! and the Countess Conspiracy! One more day! One day moooooorrrrrrre! Courtney Milan is my new favorite author, hey books are just a cut above in my opinion. I would soooo love to win this, I've been dying to read it!! I've been eagerly counting the days for this one to come out! I've enjoyed the whole series thus far, and adore Sebastian as a character. We don't know enough about Violet, but the sneak peeks from FB have shown some interesting glimpses into her character. Hi, Courtney! I am so looking forward to reading some of your novels! I am ashamed to say that I have seen them but have never read any. I am a reviewer for the blog, bookworm2bookworm and would love to promote you on the blog. Tomorrow is our 47th wedding anniversary so I’m crossing my fingers in hopes of winning a copy of your novel. Thanks for the great giveaway. I do love your books, Courtney! I also really like your choice of Halloween character. Eowyn has always been one of my favorites! Also, heifer.com is new to me. I'd heard of giving goats, but not chickens. :-) Merry Christmas! Agree! I'm so excited for Federica's story and it intrigue's me that the title implies that she's a mistress! @Connie -- Happy Wedding Anniversary to you! A new book - Yay! Courtney is an auto buy for me & I'm always eagerly looking forward to her new book(s). You write the kind of books that I just love to read. I've only read two books by Courtney Milan (Unveiled and Unlocked) but I definitely plan to read more. Thanks for the giveaway offer. Loved the book and am already eager for the next. Loved the victory over fear on Violet's part -- but I'd best say no more. Thanks for an always-interesting take on the past.